TOP COPY. 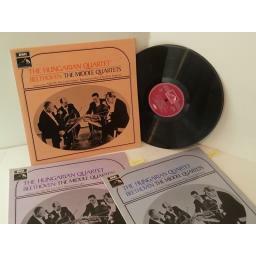 BEETHOVEN the middle quartets volumes 1, 2, 3, HQS 1159, HQS 1160, HQS 1161, 3 record set. 1966 UK Press on his master's voice, stereo. Sleeves are in excellent condition with strong uncrushed spines and minimal storage wear marks. Vinyl are in excellent condition with minimal spindle/superficial marks. Minor background noise in places. I do not sell records that are warped or jump. All records will be posted with extra card stiffeners. If you feel the record is not as described I will give a full refund.